Brooklyn Hampton is from Natchitoches, Louisiana. She attended Natchitoches Central High School, where she served as chapter parliamentarian, reporter and president throughout her FFA career. Brooklyn also represented Area II as the 2017-2018 President. During her FFA career Brooklyn has accomplished many great accolades including five state championships in Ag Issues, Dairy Foods, Agronomy, Floriculture, and Prepared Public Speaking. Brooklyn has also been fortunate to represent our state on the national level multiple times, receiving two gold emblems including a national championship in the Agronomy Career Development Event. Although extremely active in the National FFA Organization, Brooklyn additionally participated in many extracurriculars at school such as the Natchitoches Central Athletic Training Program, Fellowship of Christian Athletes, Future Business Leaders of America, Student Government Organization, Beta Club, National Honors Society, and Natchitoches Central Class Officers. She also managed to stay highly involved with her community by being a member of Westside Baptist Church and representing her city as a 2017-2018 Natchitoches Christmas Belle. Brooklyn is a college freshman attending Louisiana State University majoring in crop science. She hopes to use her degree to continue advocating for the future of agriculture. 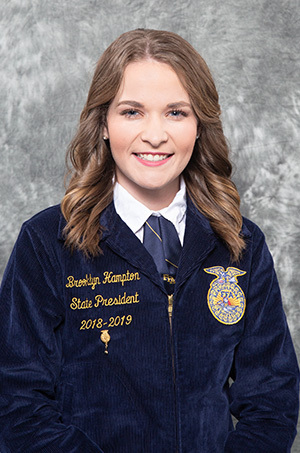 Over her year of service, Brooklyn aims to teach others how to advocate for the agricultural industry while building positive relationships that will last a lifetime. Brooklyn Hampton is proud to serve as our 2018- 2019 State FFA President.